The Louvre, also known as the Louvre Museum (French: Musée du Louvre) is one of the world's largest museums, and is also the world's most visited museum, receiving more than 8 million visitors each year. The museum is located on the Right Bank of the Seine in Paris, France. 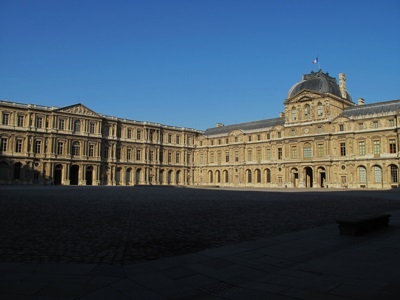 The museum is housed in the Louvre Palace ( (French: Palais du Louvre), which was originally a fortress built by the French King Philip II (1165 to 1223). The original building was subsequently extended many times, although some remnants of the original fortress are still visible in the basement of the museum. After, King Louis XIV relocated the royal household to the Palace of Versailles in 1682, the building was at first used to display the royal collection. After the French Revolution, the Louvre became a museum, and opened as such in 1793.